RENTON, Washington — Local police here have charged three teenagers in connection with what police call a vicious animal fighting ring that has left hundreds of animals dead or injured. “We found some of these poor animals in terrible health,” Gaffney said. “One of them was so injured that all it could do was flop around on the ground,” she added. Gaffney said that police were tipped off by a local game manufacturing company headquartered here. “Some workers at Wizards of the Coast came to us, told us where the fights were happening and asked us to put a stop to it,” Gaffney said. “They were quite emphatic, and very eager to see us get these ‘battles’ off of the streets,” she said. Modern is pretty much the best format right now; there are many good decks and lots of room for someone to innovate. 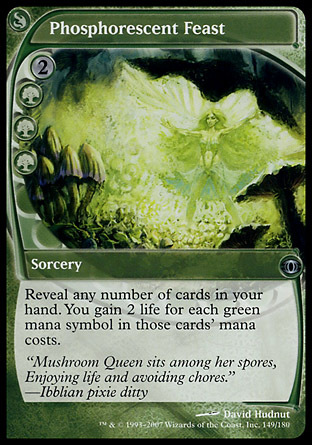 I’ve been thinking lately about how good Ponder should be in Modern. At this point, I really can’t imagine running a deck without it; and it’s unbelievable to me how many decks I see not running it that could. If there’s anything I hate, it’s not drawing the cards I need. Ponder fixes that. I’ve been testing many decklists with Ponder, and I’ve settled on a favorite that my playtesting hints could break the back of this format. The important thing is to stick a Bitterblossom; that being done, Skullclamp becomes insane. Obviously, Ponder gets you to that goal. Jace is a card selector, and he can be a win condition or, in an emergency, take care of a problem, at least temporarily. Jitte can fix your life total if you run into Bitterblossom trouble, and the awesome Stoneforge goes and gets it for you, not to mention getting Skullclamp! I’ve done some pretty extensive testing against the best decks in the format, and if you build this deck, I think you’ll be amazed at just how good Ponder is at “solving” Modern. Here are some playtesting notes. You’ll have some trouble against Wild Nacatl, but you’ve got a secret weapon in the sideboard — Mental Misstep. Most people don’t expect free counterspells against their aggressive creatures, so Mental Misstep from the board. Use Helm of Chatzuk to survive the early game, because banding is incredible on defense. Don’t be afraid to use Mental Misstep against Glimpse of Nature or Green Sun’s Zenith for zero, either. The bad news is that you can’t Mana Leak lands. The good news is that you can Mana Leak Primeval Titan all day. Bring in your removal for game two, and don’t forget Mental Misstep from the board — it counters Rite of Flame! Your big problem here is the flashback on Dread Return. They’re going to put Dread Return into the yard, and they’re going to try to bring back a huge Golgari Grave-Troll. This is where you need Mana Leak desperately. Hoard them — don’t use them for things that aren’t going to kill you! Also, be sure to remember Mental Misstep from the board. It stops their Ponders, should you run into a Dredge player running it! Ike Boger is a tournament-level player and correspondent for The Magic Lampoon. 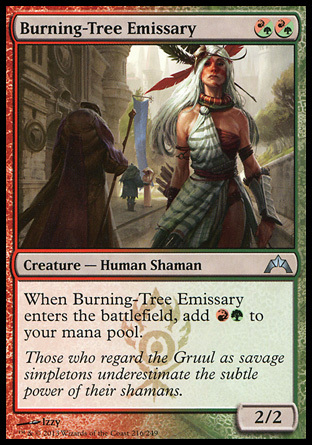 This week’s card is Burning-Tree Emissary. If only there were some other cards that worked with this to make it playable in Standard. The Magic Lampoon is now on Twitter. You can find us here. Follow us on Twitter and you can see when we have updates. You know, Wizards of the Coast just keeps trying harder and harder to get our money. First they printed planeswalkers, because they knew that they would cost like a million dollars. Then they printed mythics, because they knew that those would cost like a million dollars. But now, finally, this is like the last straw. OK. I mean, I’ve never seen a more blatant attempt to get our money. It’s a Fish AND it’s a CRAB. 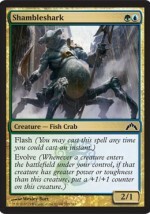 How do I know whether to put it in my FISH deck or in my CRAB deck?! It’s like, normally, I have to open like a million packs in order to get four of a card that I need. But this time, I need EIGHT of them FOR MY FISH DECK AND FOR MY CRAB DECK. You shouldn’t need eight of a card. Do you know how many packs I had to open to finally get eight of them? So like in order to buy all those packs, I had to lie to my dad and tell him that I needed money for another textbook. Because of Wizards of the Coast, I’ve had to lie to my dad like a million times. Why don’t you just go ahead and print like an Elf Goblin Wizard Crocodile that I’ll need for like four decks. THANKS a lot, Wizards. I hope you know that you’re single-handedly bankrupting my dad. Marvin Lursen is a new Magic player and a Magic Lampoon correspondent. Since Time Spiral block was all about time running amok, the future had intruded on the past, allowing us a glimpse into what will become. Or rather, what might become. Wizards of the Coast said at the time that the cards from the future might be from actual futures, and might be from futures that do not come to pass. Well, let’s be serious for a second. If you print cards and say they’re from the future, but then you say that they’re from futures that won’t happen, what fun is that? That’s not very fun. It’s a lot more fun when the cards from Future Sight actually were from the future, isn’t it? There were 81 “futureshifted” cards. 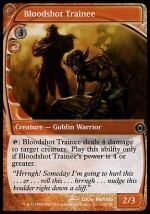 For every one genuinely reprinted as though it were a new card, Wizards gets a point on our Future Sight Scorecard. The higher the score, the cooler Future Sight was, looking back on it. It has to be reprinted as though it were a new card, because in order to have been from the future, it has to be “from” the later set. Is that a time paradox? Wrap your head around that one for a second. Now, Wizards will never get a perfect score of 81, because Steamflogger Boss lol. But that’s OK. Let’s just see how things are going so far. 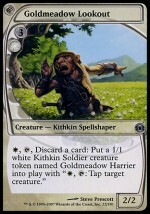 Mistmeadow Skulk — This is a great job. Well done. This card came from the very near future — the very next block. Well, the half-block after the very next half-block — Shadowmoor. 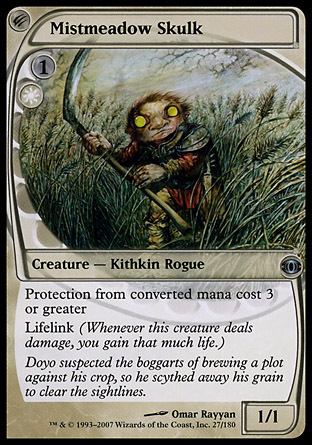 Since sets are decided in advance, it’s clear that this card was a bona fide look into an already decided future. So that’s terrific. 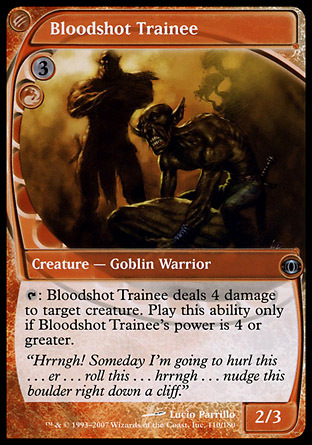 Bloodshot Trainee — whoa, we’re into red already? That’s not good. Anyway. 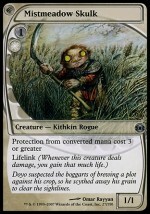 This one was reprinted in Scars of Mirrodin. It doesn’t seem to have a ton to do with that block, but nice job anyway. 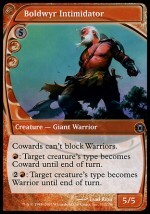 Boldwyr Intimidator — A fantastic reprint. It’s from Morningtide, a set about Warriors! You can’t do much better than that. Great job, kudos all around. Phosphorescent Feast — From Eventide. It’s too bad the Future Sight version doesn’t have the Chroma keyword, but credit where credit is due. It was from the future. Graven Cairn — Not only was this printed in Shadowmoor, but the whole cycle made it into the block! Great job. The Future Sight version talks about a future land of Kar-Sengir — no doubt a ferocious land of vampires. Wait, they just did a vampire block. 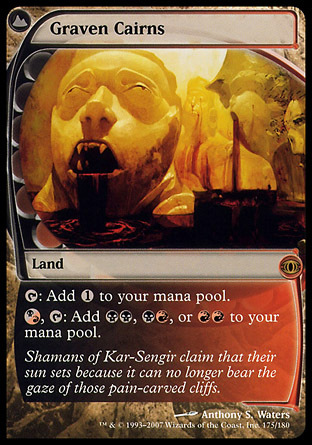 Oh, no, that means Kar-Sengir will probably never materialize. That’s OK. This card was from the future anyway. Maybe it got twisted in time along the way. Zoetic Cavern — This is from — Commander? Is that a real set? Well, it’s a set with new cards, so, we say that counts. 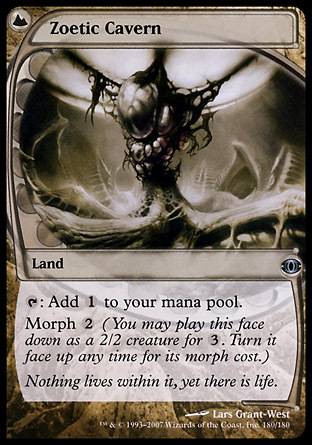 Note that it barely counts, because what does Commander have to do with morph? Apparently, Zoetic Cavern is from a terrifying future world where brave, ignorant commanders who are incapable of understanding spells outside their own colors do battle. That’s worth a point. 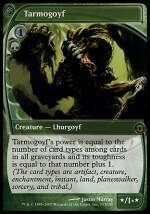 Tarmogoyf — This card has never been reprinted. But you know what? The Future Sight printing of the card mentions planeswalkers, which didn’t exist as cards yet. That’s so great that we’re willing to give a point. Clearly, this card came from the future, even if we don’t know what set. Ghostfire — This card also has not actually been reprinted. But it talks about the Eye of Ugin, which later turned out to be in Zendikar; and as a colorless instant, it hints at Rise of the Eldrazi! We’re going to give this one a point for being from Emrakul’s favorite future. Goldmeadow Lookout — A reader pointed out this one, as you’ll see if you read the comments! 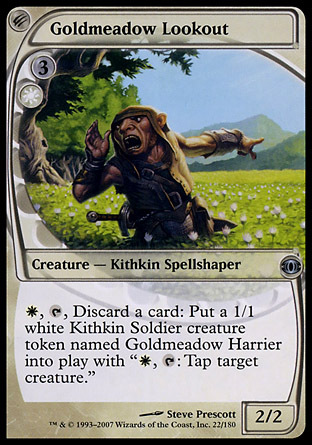 It makes Goldmeadow Harrier tokens, which are from the future, Lorwyn. That should count, too. Excellent job. Bound in Silence — This card points to a future with tribal cards, as one of our readers pointed out. Excellent job. Tribals would of course feature prominently in the next block, Lorwyn. This card is clearly from the future. 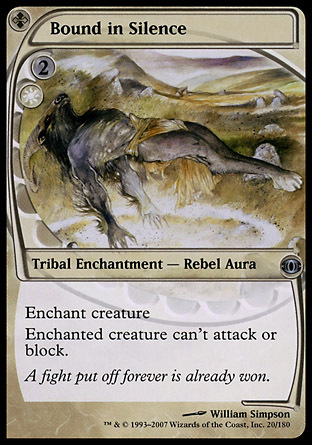 Spin into Myth — reprinted in Archenemy. Same thing. 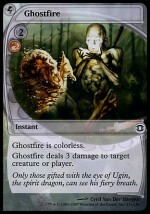 Frenzy Sliver, Homing Sliver, Virulent Sliver — reprinted in the premium Sliver deck. That’s not even a set. 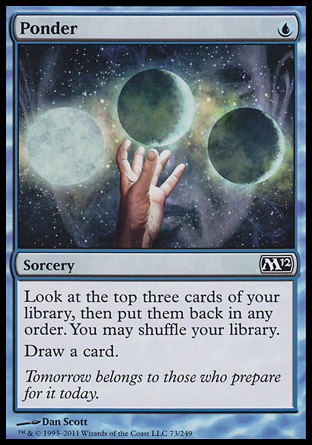 That’s like, “a card from an unimaginable future where we reprint it.” That definitely doesn’t count. 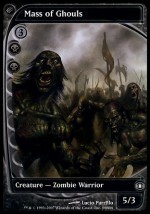 Mass of Ghouls — reprinted in 10th Edition. The whole point of this card being futureshifted was that it was in a textless frame. We love that, honestly. We’d reprint Watchwolf in a textless frame in two seconds. The reprint in 10th Edition is in a normal frame. Was Mass of Ghouls from a nightmare future where vanilla creatures appear in normal card frames? We don’t think so. Doesn’t count. Edge of Autumn — reprinted in a duel deck. This is basically the same issue as reprinting it in a premium deck. No point. 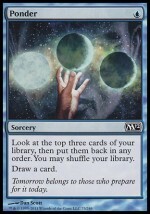 Frankly, if we were in charge, it would be required to reprint at least one futureshifted card per year. We’ll check back in a year to see if the score has changed. - Feb. 7, 2012. The score at that time was 10. This week’s card is Boros Reckoner. 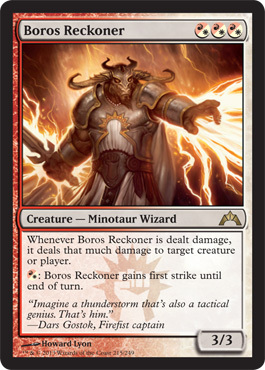 A holy warrior like Boros Reckoner would never commit a blasphemous act. The Magic Lampoon has a Facebook page. It’s located here. If you’re on Facebook, by “liking” the Magic Lampoon’s Facebook page, you’ll see on Facebook when we have a new post. No idea what Throne Magic is? Check out our introduction to Throne Magic. A while back, we introduced Holdings to you for Throne Magic. We showed you 10 of them. The truth is, we’ve been testing far more Holdings than what we showed you, and we’re ready to show you some more. We’ve been playing with these new ones for a while, and they have made our games very interesting. Here’s a one-paragraph reintroduction. Holdings are places that players can control and that provide benefits to their controller. They work a lot like the Throne. Like the Throne, Holdings are invincible to everything except combat damage. Players can attack Holdings with creatures in the way that a Planeswalker can be attacked. The controller of a Holding may use his or her creatures to block and defend it. If a Holding is dealt any combat damage, the controller of that damage gains control of that Holding. Holdings cannot be tapped, bounced, destroyed or otherwise affected, except by combat damage. However, unlike the Throne, any player may control one or more Holdings. A player does not have to be a Claimant to control a Holding, and a player may control any number of Holdings. So, yes, Monsters including the Dragon can control Holdings. If you want to read the full rules to Holdings, you should read the article where we introduced the first 10. You’ll find it here. You’ll note that Farmhold is displayed three times. We allow up to three Farmholds in one game. - Bolgirn: At the beginning of your upkeep, you may put a +1/+1 counter on target creature you control. - Farmhold: Whenever law is chosen, you may gain 2 life. - Ixenverthicha: Whenever chaos is chosen, you pay put a 1/1 red Dragonborn creature token onto the battlefield. 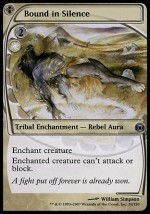 - Myrvanna: At the beginning of your upkeep, you may have target creature you control gain lifelink until end of turn. - The Norjak: At the beginning of your upkeep, add 1 to your mana pool. // Mana produced by The Norjak doesn’t empty from your mana pool as steps and phases end. - The Shadowlands: At the beginning of your upkeep, choose one: You may have target creature you control gain shadow; or you may have target creature you control lose shadow. - Ultar: At the beginning of your upkeep, you may clash with an opponent. If you win the clash, draw a card. Bolgirn: The great Dwarven city produces countless armaments. This is one of the strongest Holdings, and you won’t want to let anyone else have it for very long, unless that person is on your “team.” This Holding is a monster in the hands of someone who uses counters for tricks, so pay attention to it accordingly. Note that you don’t have to place the counter (you might not want to in weird circumstances), but you do have to choose a target, if you’re able. Farmhold: The Farmholds are strictly worse than the three “villages,” Esseldell, Forth and Galdi. Even so, they’re not to be overlooked. Enemies won’t want the Throne holder to have two of them, because choosing law over and over becomes very strong. At the same time, the holder of a Farmhold won’t be targeted as much as the holder of a village. Ixenverthicha: That’s pronounced “Ix-en-vear-thick-a.” The forbidding mountain of fire is the home of red dragons, and their nightmarish offspring. This Holding can get pretty dumb pretty quick, so pay attention to who has it and who has the Throne. By the way, we invented the creature type “Dragonborn” so that this Holding wouldn’t be overly synergistic with Goblins or some other existing creature type. Myrvanna: The ancestral Elf homeland is another strong Holding. This can be far, far better than a village or a Farmhold, without necessarily looking like it. It’s not so dangerous in the hands of a player with weenie creatures, and incredibly dangerous in the hands of anyone with a big monster. So prioritize it accordingly. The Norjak: This dead mountain range, the home of countless Trolls, no longer produces red mana. But it’s still powerful, and especially strong during winter. (Not playing with Seasons? Check out our article.) Mana not draining at the ends of steps and phases means that it also doesn’t drain at the ends of turns, so Norjak mana sticks around turn after turn. But the ability that lets you keep the mana is on The Norjak itself, so if you lose this Holding, you will lose the mana. We want to reiterate — during winter, this Holding starts looking really good. The Shadowlands: Creatures warp in and out of our plane in this mysterious realm at the edge of civilization. The Shadowlands wins games. Is it strong? It’s so strong that it was the one Holding we were most worried about sharing with you. The ability does not end at end of turn — the creature will retain or lose shadow from now on. Thankfully, a creature with shadow can’t block a non-shadow creature that is attacking The Shadowlands to steal it. Pay attention to this Holding at all times. Know who has it, and what creatures might get shadow from it. You can go from just fine to dead in no time flat. Ultar: The frozen lands to the north hold the secrets of an ancient magical civilization. Ultar is strangely self-balancing — the player most likely to take it early often turns out to be the player who has trouble winning clashes. That means this Holding is not as good as it looks. Some of the other Holdings are much more important to take first. Still, Ultar is fun, and you can do other players a favor just by clashing with them. Good luck, and may your armies conquer the land from one end to the other. Contact us at The Magic Lampoon here.